A plethora of brands are celebrating International Women's Day today, and if you scroll through Snapchat, you'll likely see a promo for Goldman Sachs. As part of a campaign to promote the 10,000 Women project, which provides business and management education for women in developing countries including China and Afghanistan, the Wall Street bank is running ads alongside editorial content in four Discover channels: Refinery29, Vice, BuzzFeed and National Geographic. According to Snapchat, it's the app's first content-related ad buy across Discover channels, and was put together after Goldman Sachs created the campaign's idea and creative. The ads will also run in the International Women's Day Live Story—the string of photos and videos collected around live events. 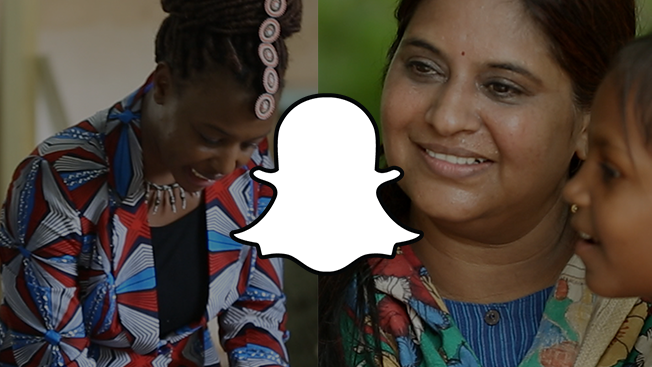 "Snapchat allows us to reach an important audience in real time and join a conversation about how best to empower women in emerging economies," said Amanda Rubin, global co-head of brand and content strategy at Goldman Sachs. The campaign is the second time the bank has advertised with Snapchat. Last fall, the brand ran ads within Live Stories located around college campuses as part of a recruiting push. After more than a year of experimenting with different formats and ad prices, inking brands for multiple campaigns is probably in Snapchat's best interest to keep business growing. Yesterday, Re/code reported that Snapchat is aiming to bring in $300 million to $350 million in revenue this year, up from $50 million in 2015.